In Nigeria this rarely happens but when it does, it is called a testimony. 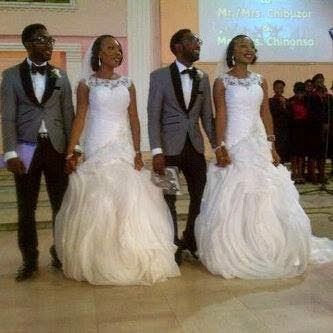 The Okunnuyi female twins got married to the Okonweze male twins (pic above) on the same day and they sure look very identical too. I love the idea and its amazing too. Looking at them I do hope my future hubby will give me a set of twins as my future pet project. (writing a proposal to God now for approval).